Order one for each ME office and location to be fully compliant. 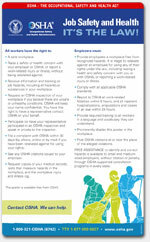 The OSHA poster is included on the Maine Complete Labor Law Poster. When you order the Maine Complete Labor Law Poster, it will satisfy your State, Federal, and OSHA posting requirements with one poster. 11/2018 - Minimum Wage Poster - Revised to include new minimum wage of $11.00 per hour, effective January 1, 2019. 11/2017 - Minimum Wage Poster - Updated to reflect new 2018 minimum wage rate of $10.00, effective January 1, 2018. 10/2017 - Video Display Terminals - Complete redesign of poster with more training information. 12/2016 - Minimum Wage Poster - Updated to reflect new 2017 minimum wage rate of $9.00, effective January 7, 2016. 02/2019 - Unemployment Insurance - Revised with a few minor clerical changes as well as the removal of old contact information. 02/2019 - Regulation of Employment Poster - Added new email address as well as a new revision date. 01/2019 - Workers' Compensation - Slight revisions include the new addresses for the August and Portland Workers Comp offices and a new revision date. 05/2014 - Child Labor Law Poster - Update includes revised guidelines on recordkeeping for minors & new website listing. 10/2012 - Minimum Wage Poster - Update to Min Wage panel, to include regulation in US code, Section 31502 that regulates overtime exemption. 07/2012 - Child Labor/Family Medical Leave/Wage Payment - Very minor updates, including new TTY relay number listing and department seal. 07/2012 - Regulation of Employment Poster - Very minor updates, including new TTY relay number listing and department seal. 07/2012 - Unemployment Compensation - Very minor updates, including new TTY relay number listing and department seal. 07/2012 - Safe Work for Computer Operators - Very minor updates, including new TTY relay number listing and department seal. 07/2012 - Whistleblower Protection Act - Very minor updates, including new TTY relay number listing and department seal. 07/2012 - Minimum Wage Poster - Very minor updates, including new TTY relay number listing and department seal. 11/2008 - Family and Medical Leave Act (FMLA) - Final FMLA regulations published. Many industries such as the restaurant, retail, construction, and professional use the Maine Complete Labor Law Poster to satisfy their compliance requirements for State, Federal, and OSHA. When posted in an area frequented by employees, the Maine Complete Labor Law Poster puts a business in full compliance. Federal contractors and subcontractors are required to display more postings in addition to the general State, Federal, and OSHA regulations. Please click here to see the federal contractor and subcontractor posting requirements. Ensure your full compliance by posting the Maine Complete Labor Law Posters with the federal contractor-required postings.